A bent dropout, usually caused by the rear derailleur taking a whack, is the most common damage suffered by bicycle frames. If your frame is steel, you can usually get away with judiciously bending the dropout back into shape. Being less elastic than steel, aluminium or carbon is more likely to snap if bent. Replaceable gear hangers are therefore a good thing - especially on aluminium and carbon frames. 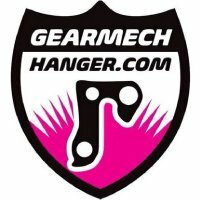 Gear Mech Hanger is a UK company who specialize in CNC engineering replacement gear hangers for the widest range of bicycle models. A potential ride saver, we would recommend packing a spare gear hanger on any significant cycle.